(Nanowerk Spotlight) Quantum dots (QDs) are nanoscale crystals of semiconductor material that glow with bright, rich colors when stimulated by an electric current. First discovered in the 1980s, these materials have been the focus of intense research because of their potential to provide significant advantages in a wide variety of optical applications, among them light-emitting diodes (LEDs). Quantum dots are expected to deliver lower cost, higher energy efficiency and greater wavelength control for a wide range of products, including lamps, displays and photovoltaics. Unfortunately, the toxicity of the elements used for efficient quantum dot based LEDs – CdS, CdSe, and their Pb containing counterparts – is a severe drawback for many applications. Therefore, light-emitting devices which are based on the non-toxic element silicon are extraordinary promising candidates for future QD-lighting applications. Researchers in Germany have now demonstrated highly efficient and widely color-tunable silicon light-emitting diodes (SiLEDs). 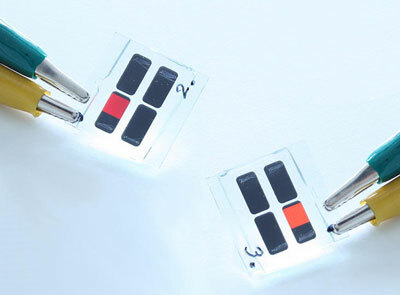 The emission wavelength of the devices can easily be tuned from the deep red (680 nm) down to the orange/yellow (625 nm) spectral region by simply changing the size of the used size-separated silicon nanocrystals. Reporting their work in the January 15, 2013 online edition of Nano Letters ("Multicolor Silicon Light-Emitting Diodes (SiLEDs)"), a multidisciplinary team at Karlsruhe Institute of Technology, led by Annie K. Powell, Geoffrey A. Ozin and Uli Lemmer, also showed that the size of the silicon nanocrystals has a significant impact on the valence band position of the material. "Compared to other reports on silicon-based LEDs, we show that the emission color can be tuned down to the yellow/orange spectral region whereas existing reports especially focused on NIR-devices," Florian Maier-Flaig, a researcher in Lemmer's group and first author of the paper, tells Nanowerk. "This is the first report of yellow/orange emitting SiLEDs based on size-selected silicon nanocrystals. In addition, size-separation of the particles leads to significantly increased device operation lifetimes." The team's silicon nanocrystals are capped with allylbenzene and produced by solid-state synthesis. The resulting nanoparticles are colloidally stable in toluene, feature sizes in the range of 1-3 nm, and exhibit photoluminescence quantum yields of up to 43%. Potential applications are silicon-based light-emitting diodes. Maier-Flaig notes that the use of the particles as down-converting red-emitting “phosphors” for white light generation is also conceivable. The latter are currently fabricated using spectrally broad emitting phosphors which do not feature a strong contribution in the red spectral region being nevertheless crucial for high color rendering indices and generation “warm white” light. With regard to practical applications, the team cautions that, in order to be compatible with II-VI semiconductor-based QD-LEDs, external quantum efficiency of the devices, quantum efficiency of the nanoparticles itself, as well as long-term stability of the devices should be further improved. "New ligand concepts and device-layout concepts could help to improve performance" says Maier-Flaig. A particular challenge is to even further increase the intrinsic quantum efficiency of the particles. Even though high quantum yields of 43% can be achieved for red emitting silicon nanocrystals (see the team's previous work here: "Size-Dependent Absolute Quantum Yields for Size-Separated Colloidally-Stable Silicon Nanocrystals"), further increase of quantum yield is needed especially at shorter wavelengths. As Maier-Flaig explains, the latter could be achievable based on new functionalization concepts well-passivating the surface of the nanoparticle. In addition, novel passivation strategies should enable an even broader tuning of the emission wavelength.